Among the many things that are ever changing throughout pregnancy, I think the most surprises I have are during post-partum. I mean I know what to expect as pretty much every inch of my body is rearranged and overtaken by my temporary resident until the day of their arrival, but afterwards I feel like I have no idea who’s body I am in. From hair loss to changes in eyesight – post-partum definitely is an adjustment I have to take in stride! This time around I had some help as I was just in need of a new pair of glasses! I am rather old fashion and have always chosen glasses from my local optometrist, however, I was recently contacted by GlassesShop.com to give their online ordering process a try! So after my routine exam post baby (because of course my eyesight changed) I decided to give it a spin. So what do you think? It’s so great to find prescription glasses that don’t seem so frumpy and plain. 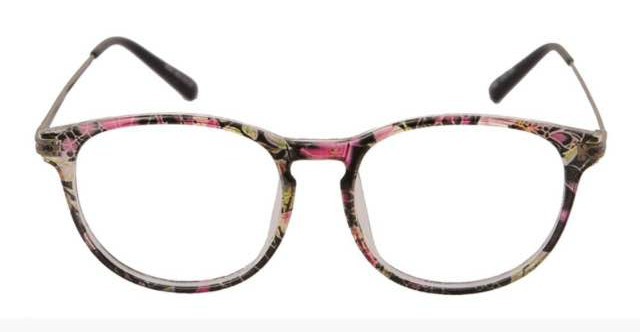 From the TONS of styles I found this floral wayfarer pair was definitely a new look and just enough pattern to go with anything I wear. I secretly love floral patterned anything – I just never know how to make it work without looking like a secret garden. What’s even better about GlassesShop.com is that they not only have prescription glasses you can purchase, but also sunglasses as well. I of course will need a new pair of those to go with these and can’t wait to order something for Mike too! He was a bit jealous that I didn’t get him anything the first go around, so I will be interested to see which pair he chooses (he is very GQ in style). I initially was concerned about cost since we’ve rearranged our budget once again and it definitely doesn’t include a lot of name brand items if you know what I mean. But to my surprise all of the glasses are incredibly affordable – and I’m seriously not just saying that! To even sweeten things up, they are currently running a HUGE promotion: First Pair of Glasses Free! This means that all new customers can have a pair of free glasses and only need to cover shipping and handling! Yes that includes optical and sunglasses, so you’ve got no excuse not to find a great pair of cheap glasses for yourself as well! You can also use the code GSHOT50 to receive 50% off on eyeglasses and sunglasses with free lenses (sale frames excluded)! So go check out their selection and come back with what you found! I would love to know which pair you chose!